For the second instalment of Norwegian Staples’ Christmas edition, our food columnist Luke Slater bravely takes on rakfisk – a notorious Norwegian Christmas dish. Norwegians love their fish and Christmas is no exception. Lutefisk has a reputation which precedes it but rakfisk is perhaps even more notorious. As with lutefisk there are numerous myths and legends. The BBC asked if this was the world’s smelliest fish. Rakfisk is a fearsome proposition to many Norwegians and non-Norwegians alike. 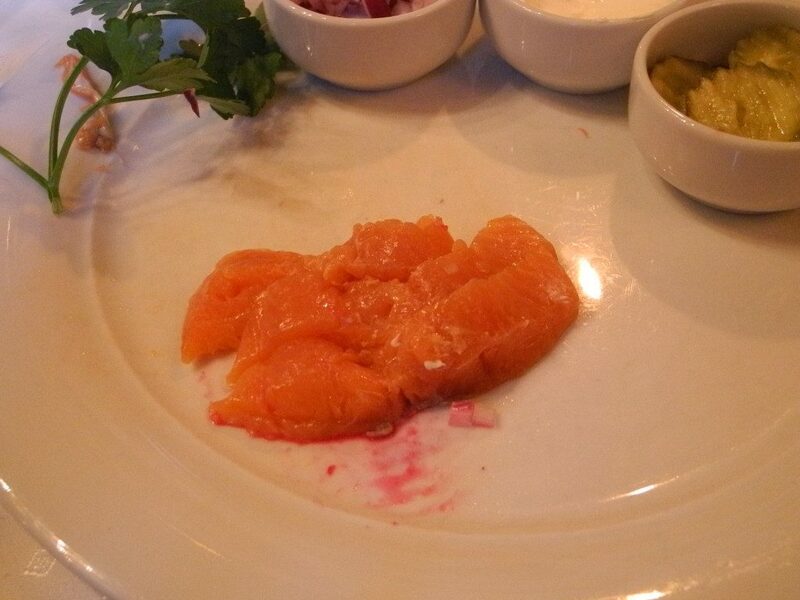 According to market research conducted by YouGov, rakfisk is ranked number 1495 out of 1550 dishes. I’m keen to find out if this is a fair and accurate assessment of this Norwegian Christmas staple. My biggest hope is that it is not. Put simply, rakfisk is trout which has been salted and fermented from anywhere from two months to a year, being stored in cold temperatures. Then, after some necessary preparation (when the smell is most pungent), it is ready to eat. From a distance, it looks like plenty of smoked fish but close-up is a little different. Should I be concerned by the realization that rakfisk should be avoided by pregnant women and those with poor immune systems? Well, if you are sitting opposite a pregnant woman, as I am, and are as unfamiliar with Norwegian laws, as I am, then the answer should be yes. 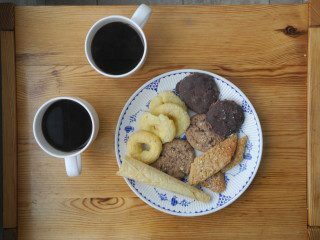 Even more reason for concern: there are numerous articles and advice on how to prepare it to avoid botulism – a man in Steinkjer died after eating it in 2015. I discovered that this is (generally) only something to be concerned about if you go through the whole process at home. Which I will never attempt. 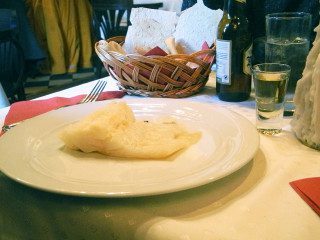 While lutefisk is a substantial serving, rakfisk tends to be a little more delicate. 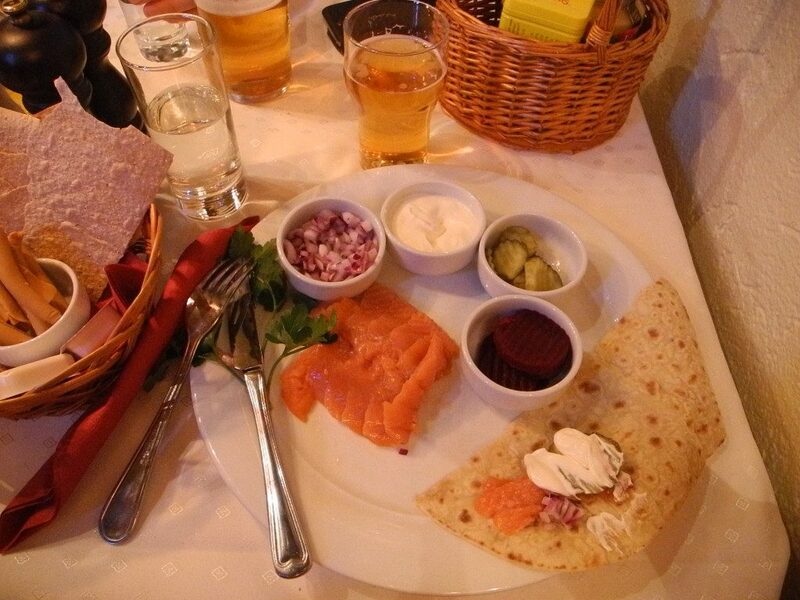 It is traditionally served in smaller Slices with some kind of cream (sour, in this case), red onion and potato pancakes (lefse) or crispy flatbread and a few other accompaniments. 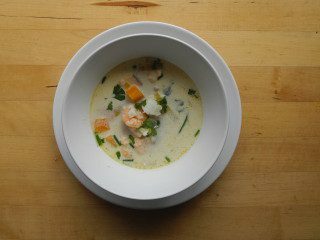 Now, the potency of rakfisk will vary and it seems that most reputable city-based restaurants will serve it towards the milder end of the scale. Still, if you get close enough you can see what the fuss is all about when it comes to odour. Naturally, smelling is not the best way to consume food. It’s to eat it. And with a little sour cream smeared on the lefse, some scattered red onion and gherkin the flavours are fantastically intense. And addictive. 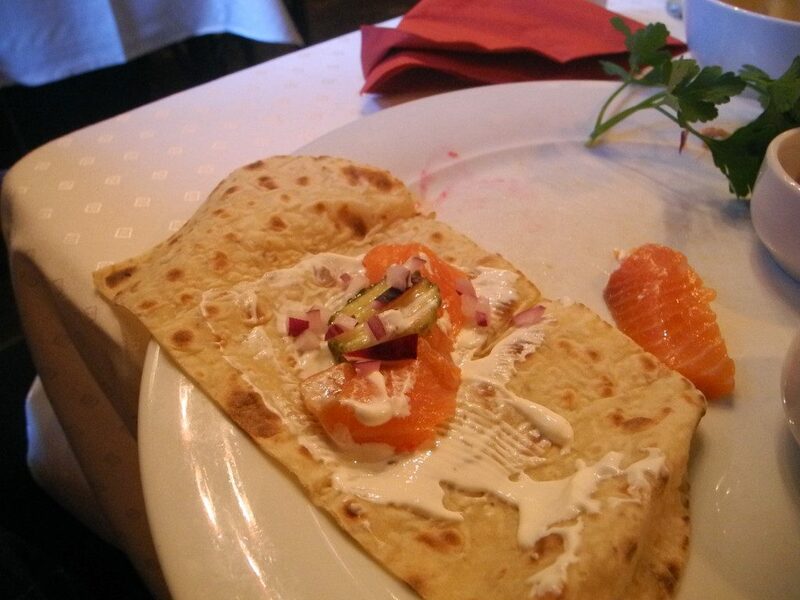 After a couple of rakfisk in lefse I wonder if the sour cream, red onion and pancake are masking the flavour of the fish, so I try it on the flatbread first and then, when I’m feeling brave enough, try the fish on its own. It has a huge kick and power. A flavour this forceful doesn’t feel particularly Christmassy, but after my third or fourth helping I’m not that bothered. I’m a rakfisk convert.